Support a gluten-free lifestyle by enhancing immune system health and reducing chronic inflammation in the body. 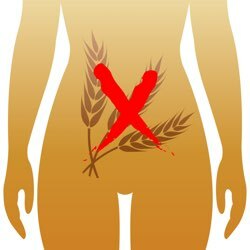 Article: So What's the Big Deal About Gluten? NuMedica Gluten Support Packets contain a powerful formula of nutritional ingredients that support a healthy immune system and reduce chronic inflammation. By minimizing your exposure to gluten, you may benefit from this daily supplement packet that promotes healthy tissues for nearly every organ in your body as well as your joints, skin, and digestive tract. Even if you do not test positive for celiac disease or have a wheat allergy, you may still be sensitive to Gluten. People who suffer from Gluten Sensitivity may experience abdominal cramping, bloating, diarrhea, constipation, and headaches. Depression, joint pain, and fatigue are not uncommon. By embracing a gluten-free lifestyle and trying NuMedica Gluten Support Packets, you can begin to repair the damage that gluten exposure has caused for your tissues as well as eliminate those unpleasant gluten-sensitivity symptoms from your life. Taking NuMedica Gluten Support Packets is a great way to kick start your body's repair process after gluten exposure. 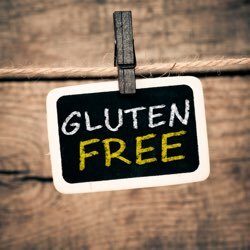 People with Gluten Sensitivity may suffer from reduced immune system function and chronic inflammation of bodily tissues. By eliminating gluten and taking this nutritional supplement, you can boost tissue repair in your body as well as encourage improved immune system function. In short, you can get your body back on track with this healthful supplement that targets areas where gluten damage was likely to occur. 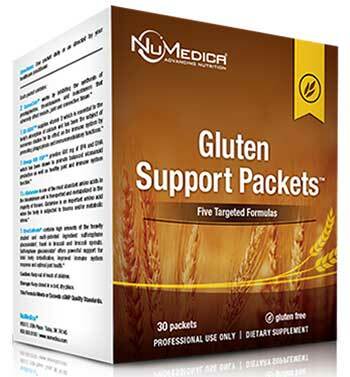 NuMedica Gluten Support Packets are designed with nutritional ingredients that are known for their healing properties. Vitamin D, for example, is essential for immune system support. 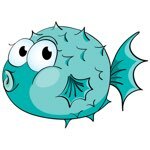 EPA and DHA support the immune system and joint health. Other nutritional ingredients target and inhibit inflammation throughout the body. All of these ingredients, together, deliver powerful benefits to people who have suffered from gluten exposure. Directions: One packet daily or as directed by your health practitioner. Other Ingredients for Omega 600 USP™: Gelatin, glycerin, food glaze, enteric coating, mixed tocopherols, sodium alginate, acetylated monoglycerides, Polysorbate 80, sorbic acid. Other Ingredients for D3-5000™: Olive oil, gelatin (bovine), glycerin and water. Other Ingredients for CurcuCalm®: HPMC (vegetable capsule), rice flour and vegetable stearate. Other Ingredients for BrocColinate®: HPMC (vegetable capsule), stearic acid and vegetable stearate. Other Ingredients for L-Glutamine: HPMC (vegetable capsule), rice flour and vegetable stearate. †Sulforaphane Glucosinolate is produced under US patents: 5,725,895; 5,968,567; 6,177,122; 6,242,018; 7,303,770 and patents pending. Stock your pantry and refrigerator with these fresh and healthy gluten-free and dairy-free foods. This is a great grocery list to start from if you want to eat healthy, but you should always be sure they fit your specific health needs. 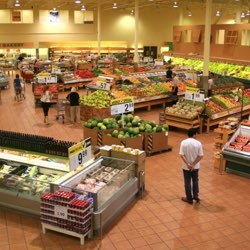 You also want to be sure that they are eaten fresh, organic, and unprocessed if possible. Celiac disease occurs for some people who have a problem processing gluten, which is a protein found in many foods. The gluten triggers an immune response that is not normal and damages the inside of the small intestine. Once that happens it is difficult to absorb the nutrients needed from the foods eaten. When Did Food Become Our Enemy? It could be that the primary key to health and wellbeing lay within our gastrointestinal tract. 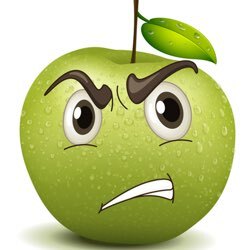 With obesity and childhood behavioral disorders at seemingly epidemic levels and our "healthcare" system lacking answers, where do we turn? Why Spend the Money for Professional-Grade Supplements? The term professional-grade is used to create a clear distinction between the quality of supplements used by healthcare practitioners compared to those used by the majority of consumers who buy over-the-counter. 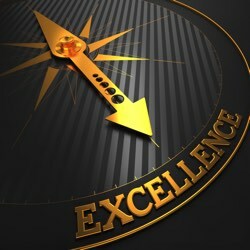 Professional-grade speaks to sourcing methods and quality of the ingredients used, the reliability of the manufacturing process, and efficacy of the quality assurance testing process. These work together to insure the supplement minimally meets and generally exceeds the standards documented on the supplement label. 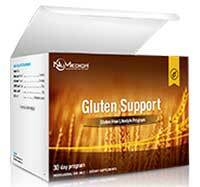 Supports immune system function, reduced inflammation, and tissue repair in individuals who are sensitive to gluten. Contains prebiotics and probiotics to support optimum digestive health by assisting the breakdown of gluten proteins consumed by eating grains. Capsule form provides support for immune system health, digestive health, and may accelerate the healing of body tissue. Natural bovine colostrum in tablet form for immune system health, digestive health, and may accelerate the healing of body tissue. Supports immune system health, digestive health, and may accelerate the healing of body tissue. Offers benefits in inflammation, weight loss, and infections. Helps to boost immunities with a team of ingredients ready to fight for your health. Powerful probiotics that enhance gut health by supporting the gastrointestinal tract and boosting immune system health. Helps to strengthen the immune system by supporting and maintaining the protective mucosal lining of the gastro-intestinal tract.